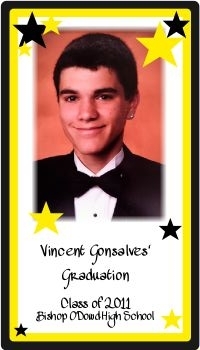 Graduation magnets are the perfect favor keepsake for kindergarten, elementary school, junior high, high school and college graduation. Minimum order is 25. Orders placed for under 25 will not be processed. Please email picture for magnets to prtyplanet@aol.com and reference your order id number. If your picture is a professional picture we will need to get permission to use the picture and you will have to get a release from the photographer. We can fax a release form to you if you need one. Also, please email pictures in a jpeg format. Magnets are approximately 2" X 3 1/2". Picture for magnet should be emailed to prtyplanet@aol.com and reference your order id number. If your picture is a professional picture, we will need to get permission to use the picture and you will have to get a release from the photographer. If they do not have a release form, we can fax one to you. Also, please email the photo in jpeg format. Minimum order is 25 magnets. Any order placed for less than 25 will not be processed.